Sonoran Style Enchiladas - Made It. Ate It. Loved It. At the start to each New Year a lot of people set different types of goals. I personally love goal setting and achieving! I know I get a lot of people asking me how I meal plan so that when dinner time comes around it is a more enjoyable time and not a chaotic race to get something on the table with their family starving around them as they are trying to cook. Each week I set a menu of the things that I will be cooking that week. That menu has everything from main dishes to sides and desserts. Usually I am on some type of kick and you can tell exactly what that is when you read my menu. I was able to pick up some amazing Zaycon Ground Beef a few weeks ago. I met their Social Media Coordinator Arah in Seattle last year and was able to re-connect with her later and set up a chance for me to try out their products. My husband and I were pleasantly surprised with the high quality of ground beef that we were given! Not only is it 93/7 super lean, it comes from grass fed cattle, it also has amazing flavor and tastes very good! 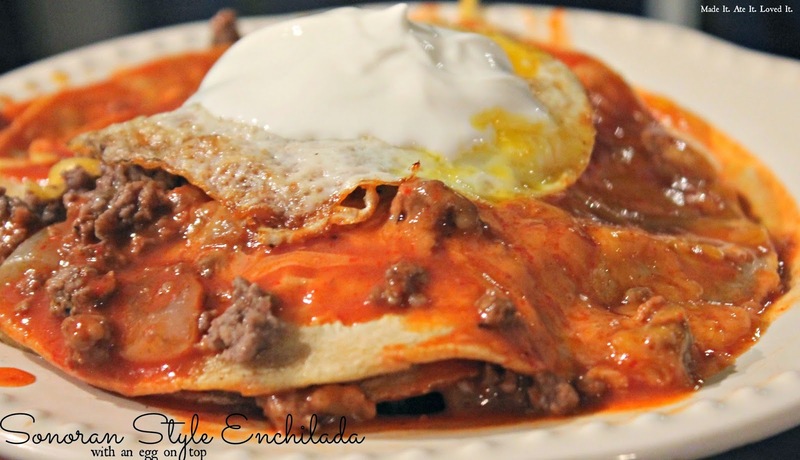 Besides these yummy Sonoran style enchiladas we have used the meat for tacos, hamburger patties, meatballs, spaghetti sauce, and still have a freezer full of meat for me to use throughout the next couple of months. Buying meat in bulk also makes meal planning easier. That way you always know what meat you have so that it is easier to put a meal on the table! Grab your Zaycon Ground beef and brown it with minced garlic, salt, and some diced onions. In a small frying pan add a little oil and heat up. Dip tortillas in oil. Pat dry with paper towels. 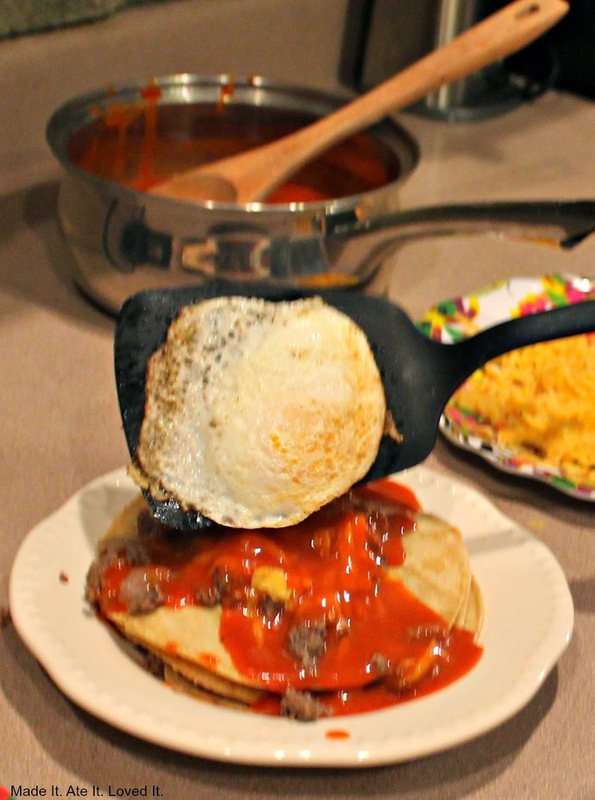 Heat up enchilada sauce in a sauce pan. On a skillet frying up some eggs. Then get it all layed out and ready to assemble. Grab a tortilla place it on a plate. Add a scoop of ground beef and cheese, then add a tortilla add more ground beef and cheese, and repeat to as many tortillas as you want. Then top with enchilada sauce. 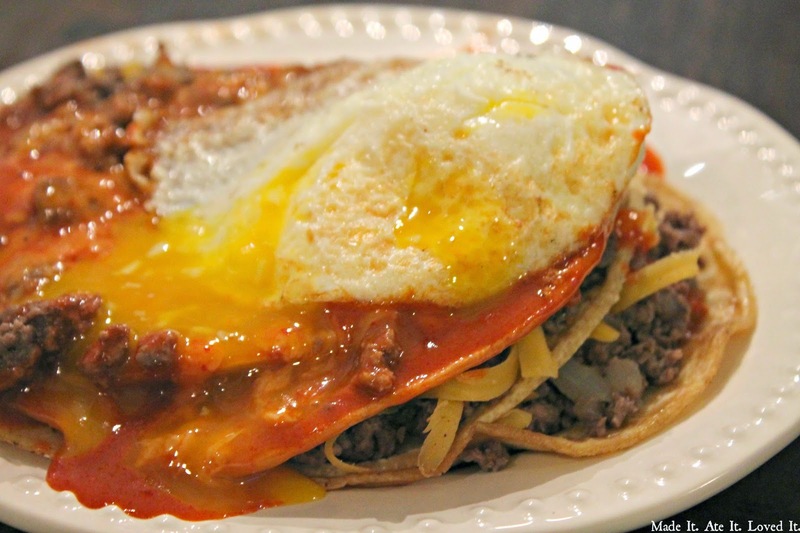 Then top with a fried egg. Add sour cream and you can add diced tomatoes and lettuce too! Break the yoke and enjoy! 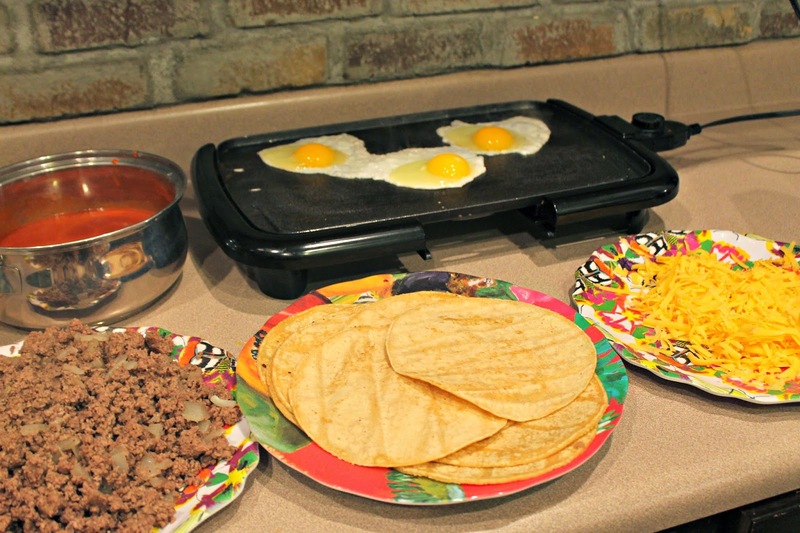 In a small frying pan, dip tortillas in oil. Pat dry with paper towels. 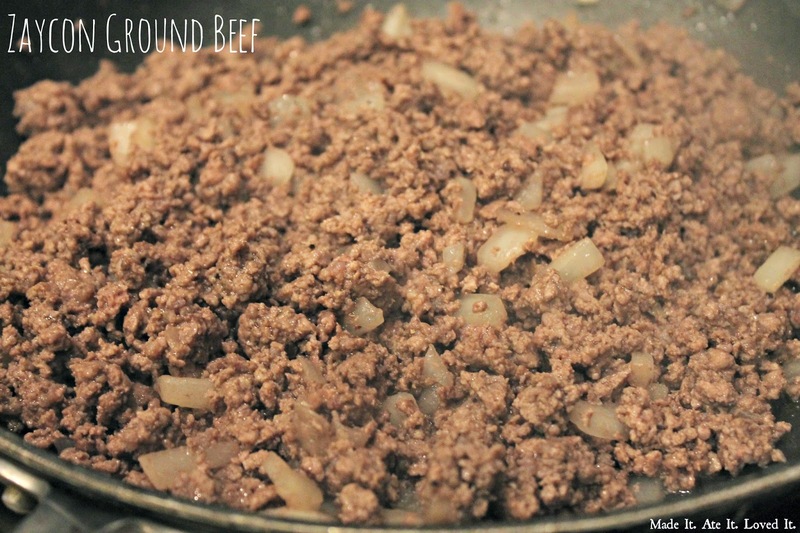 In a large frying pan, brown ground beed with minced garlic, salt, and diced onions. Drain ground beef and set aside. 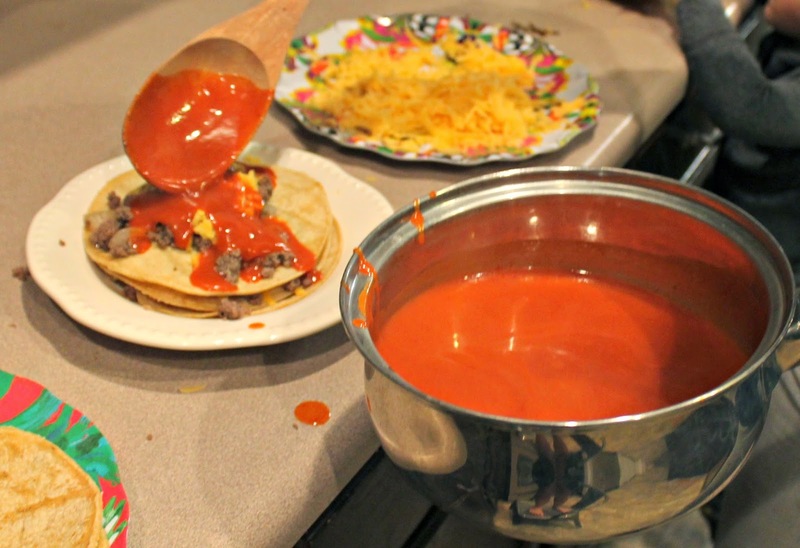 Heat enchilada sauce in saucepan. Grab a tortilla and start layering. Put a spoonful of meat, sprinkle with cheese and then layer 2 to 4 times depending on how large you want it. Top with a butter basted over medium fried egg. Garnish with lettuce, tomato, and sour cream.